Bristol five-piece Idles kick off their UK tour with a headline gig at Bedford Esquires on Sunday. 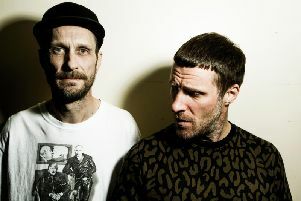 The band met at the ‘death of the indie scene’ in Bristol and began making visceral and sometimes unlistenable post-punk. They began with their own club night Batcave, practising religiously until they felt they had found their sound and their live show. With that in check, they have now finished their debut album Brutalism which is out in March and are about to embark on a full UK tour. Brutalism follows the singles tracks Well Done and Divide & Conquer which were both released last year. With no qualms about being terrifying and entertaining in the same breath, Idles celebrate their influences in a vitriolic and belligerent sound both familiar and new. Aside from their own headline tour, Idles will be opening for The Maccabees’ three final gigs in London in June and will play this year’s Reading, Leeds and Hand Made festivals. They headline Esquires on Sunday, March 5. This gig has been moved forward March 18, when they were originally scheduled to play Esquires, as the band has been invited to play the SXSW Festival in Texas. Doors open at 7.30pm. Tickets cost £7 in advance before fees and are available via SeeTickets.